Father’s Day is right around the corner and many people are looking for unique gifts for dad. When it comes to helping your little one’s pick out a gift for dad, it can mean more if the gift is something extra special. I See Me offer’s a cute book called Super Dad! Which is personalized for each customer to make it one of a kind. Believe me when I say that your Father’s Day book for dad will be unlike any other! 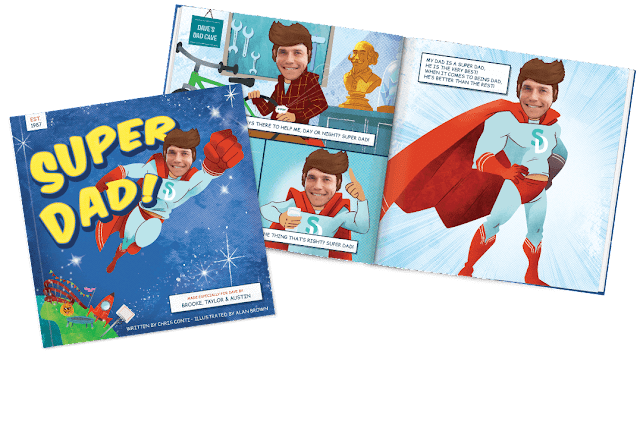 With this personalized book, you can make the Super Dad of your family feel like a celebrated superhero. The main character of the book features not only dad’s actual name, but also his face on every page. He is the Super Dad! This book can include up to four names, featuring either children or adults. I used all of my kid’s names first then added mine in last. Then you are able to add a photo of your “Super Dad’s” face. Throughout the book, Super Dad’s face lights up each scene. However, if you do not want to add a face, you can select the character’s skin tone, hair color, hairstyle (including bald), facial hair, and the option to wear glasses! You can also add up to two full pictures, one for the dedication page and another for the back of the book, to create a unique family keepsake. The heartwarming story celebrates how dad is a superhero in daily life, whether it’s doing super math, fixing the car, or teaching his kids right from wrong. Written by Chris Conti and illustrated by Alan Brown. Available at personalized publisher I See Me! Our “Super-Dad” got this gift early so I could see what he thought. Well, he was obviously very surprised to see his face on the cover of a book! After the surprise wore off, he read it and couldn’t stop talking about how cool it was. He looked a little embarrassed at some of the pages, but was very delighted to ready each page. The kids had a blast watching him and teasing him over some of the various situations “Super-Dad” found himself in! He played along and was saying things like “Oh, I remember when this happened! That was crazy!” The gift was a hit and it made for a long-lasting memory that we (definitely HE) will never forget.